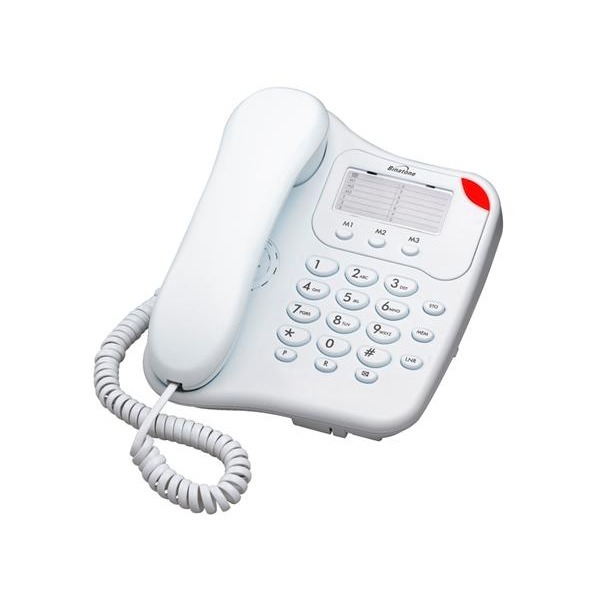 Binatone Lyris 110 is ideal for anyone looking for a no-frills corded telephone that is simple to operate without getting bogged-down by unnecessary features and gadgets...and at a great price too. With large concave buttons, the Lyris 110 is simple to use and perfectly suited for those that may be visually-impaired. Ringer volume is adjustable but there is also a visual indicator which flashes to show an incoming call, perfect for noisy households or users who may be hard-of-hearing. The integrated 13 name/number memory ensures that your most important numbers are always close-by. There are also 3 direct memories which are perfect for storing emergency or regular contacts. 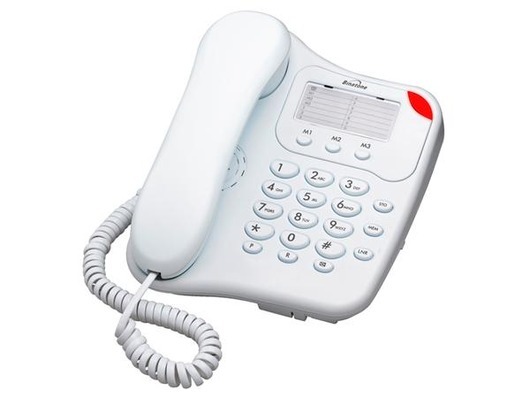 This large-button, simple corded telephone can be table top or easily wall-mounted. They say that there is beauty in simplicity and the Binatone Lyris is proof of this very mantra. In addition the Lyris also proves that, with simplicity comes value, reliability and a triumph of function-over-form. NICE PHONE IN EXCELLENT CONDITION ,GOOD PRICE AND VERY PROMPT DELIVERY - CANT FAULT IT. i have only had the phone for three days but i am pleased with the volume and sound quality,the ring tone is loud enough for me and the price is wow. Very pleased with my Binatone Lyris 110 phone the buttons a decent size, the handset has a nice feel to it, I have arthritis and this phone is good as I have difficulty gripping items so with this handset it's made easier. love it and it does exactly what it says on the tin! for an older person it would be good as well because storing your numbers is so easy to do. would definitely recommend this phone as a good buy! Excellent- very pleased with it- works perfectly- fast delivery too. Excellent budget phone in as new condition, and really fast delivery. Bought as a back up phone for if the mains go off, ideal for the job. Excellent product and prompt delivery, we brought it for mother in law and she's very happy with it and that is praise indeed! Product as described. Delivered within a week. Good purchase. Just what it claims to be. A perfectly good working desk phone for a very good price. Quick delivery. Not so good for wall mounting but fine on the desk. Very good service Very pleased with phone. Very good service with a quick delivery. Bargain price and serves purpose as a spare/back up phone. Fast delivery, excellent service. Would recommend. Wasn't too sure that this could be as good as I wanted but it is, even at such a bargain price. It came when expected, is in perfect condition,and is exactly right for the job. Thanks. Is as good as all the reviews say,very fast delivery. What wonderful service. Prompt delivery. Good value for the price. And excellent after-sales service. This is all too rare in this day and age so I really must give you top marks. Order No. 70044. Amazing, first class service, prompt delivery, and a very good product for the price. (Was 4 pounds cheaper than my local supermarket - and post free) Unusual to have service like this nowadays. Bought this for my elderly mother - a simple phone with no confusing frills! It is just the job and arrived very quickly - thank you for good service. Great value easy to use phone. Bog standard phone at a good price. Works well and fast delivery. Recommended. Fantastic service, very quick delivery, and a bargain as well . Will definitely be telling my family and friends were to go in the future! The Bintatone Lyris 110 arrived today. More than happy with it, it does what it says on the tin. More importantly I was really impressed with the price which inc'd P&P. Will deal with you again & suggest you to others to order from you. Excellent. Unbelievable price. Really pleased with the phone. Delivery very quick. Excellent product, exactly what I wanted, easily assembled and commissioned. Delivery, packaging, etc faultless. excellent and swift service, highly recommended. yes I have recieved the phone on friday and its working good , and was happy because the shipping was fast only few days ,it took , thanks ,I hope to make busnies with again next time , tks , a lot. Fast delivery and service:A easy to use phone ok for desk but nor very good for wall mounted in my opinion.